In the churchyard of St Andrew’s, Oddington there is a headstone commemorating Lilian Grace Wilson. She was born at Islington, Middlesex on 4 October 1920, the daughter of Henry and Lilian Duly. 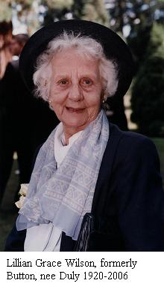 She died at Stafford on 1 February 2006 and her ashes were interned at Oddington. Alongside Lilian’s headstone is another, commemorating her sister, Joyce Irene Gibbard, who died on 16 August 2006. Joyce was the mother of Margaret Lambert, of Latchmore, Oddington and both Joyce and Lilian had expressed the wish that their ashes should be in the tranquil setting of St Andrew’s. Lilian’s previous married name was Button. She was the proud grandmother of a certain World Champion racing driving, namely Jenson Button.